In the Egyptian Gallery of the British Museum sits an odd-shaped black rock - the Rosetta Stone. Unimpressive at first glance, it is nonetheless one of the greatest treasures of ancient Egypt, for it holds the key to this magnificant civilization. Before the Rosetta Stone was found, Egyptian history was lost to the world. The only clues were the mysterious picture writings that adorned temples and pyramids. For hundreds of years, scholars struggled to decipher these hieroglyphs. Then, in 1799, soldiers in Napolean's army stumbled on the Rosetta Stone. 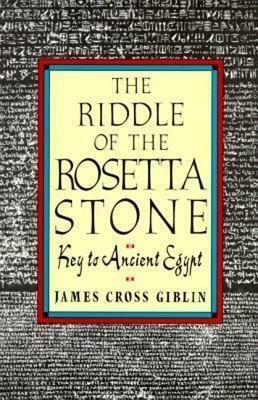 "Until the Rosetta Stone was finally translated and the decoding of hieroglyphic writing made possible, much of Egyptian history was lost. The author has done a masterful job of distilling information, citing the highlights, and fitting it all together in an interesting and enlightening look at a puzzling subject." --H. "The social and intellectual history here are fascinating. A handsome, inspiring book." --K.